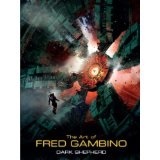 Dark Sheppard, The Art of Fred Gambino, is a feast for the eyes. This book shows us how creative the human mind can be and with the right talent how much an artist can accomplish. I am far from an art critic, but that is not much of a problem for there is little to criticize here. Gambino takes through the worlds fantastic. He creates things that well...are quite apt to blow your mind. Part of the book involves a movie proposal, video games, and other creative endeavors. So obviously this artist has diverse talents. However, I just enjoyed kicking back and taking it all in. I would recommend this book to anyone who likes science fiction and the art it inspires.